Honey straws are a more natural approach to satisfying those sweet cravings. These sweet treats are straws of liquid flavored honey, and are available in 8 flavors: Apple, Blueberry, Cherry, Grape, Strawberry, Raspberry, Watermelon, and natural Honey (no added flavor). 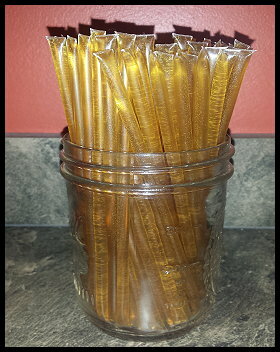 If you like to sweeten your coffee with honey, the natural honey straws are perfect to keep in your desk at work for your morning cup of coffee! Ingredients: Sugar, Corn Syrup, Honey, Natural and Artificial Flavors, Yellow 5, Blue 1, & Red 40. Ingredients: Sugar, Corn Syrup, Honey, Citric Acid, Natural and Artificial Flavors, Yellow 5, Yellow 6, Blue 1, & Red 40. 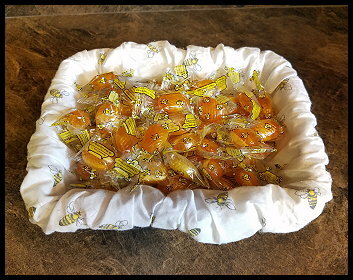 Honey candies are a perfect treat for anyone looking to satisfy a craving for something sweet. These hard candies are filled with a liquid honey center, that also makes them perfect for a sore or scratchy throat. 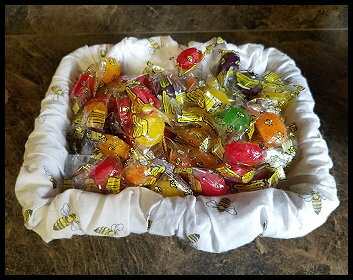 The "double honey" candies are honey flavored hard candy with a liquid honey center, while the "assorted honey" candies are a mix of apple, grape, strawberry, lemon, orange, and honey hard candies with a liquid honey center. Please indicate "double honey" or "assorted" when ordering.